1. The Boultenhouse House is a Georgian syle mansion constructed by Christopher Boultenhouse c.1840. The ground floor has an entrance hall and four rooms devoted to museum exhibits. 2. The Bulmer House an earlier Georgian farm house constructed by George Bulmer c. 1792, to which the Boultenhouse House was added c.1840. 3. The Anderson Octagonal House a unique octagonal house constructed by Captain George Anderson in 1855, moved to this site in 2012. 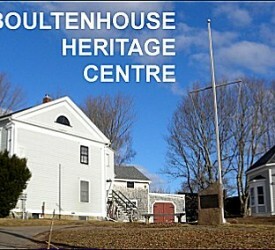 The Trust’s Resource Centre is located on the main floor of the Anderson Octagonal House.